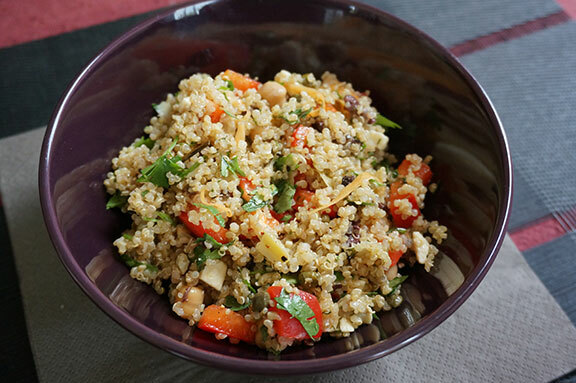 Quinoa has such a light delicious flavour, it’s perfect for summer salads. Put the quinoa in a pot with 2 cups of water, cover with a lid and bring to a boil. Once a boil is reached, lower temperature to a simmer immediately. Keep lid on. Stir every 5 minutes and let simmer until you no longer see water in the pot. Remove from heat immediately, keep lid on and let sit for 15 minutes. Remove lid and fluff the quinoa with a fork letting it cool down – you may need to leave it for an hour or so. Once cool, mix quinoa with the oil, vinegar, salt & pepper. Add in all remaining ingredients mixing well. Voila! This salad is easy to re-engineering using alternate vegetables like steamed asparagus, tomatoes, onions, okra, grilled eggplant, corn, celery, artichokes, cabbage, steamed brussell sprouts or green beans. Mix the ingredients to suite your taste buds! This dish is high in all the great nutrients & low in bad fats. It is a great source of protein (roughly 10g/cup), lots of great fats (the kind essential for good skin & proper cell development) and packed with vitamins for healthy vibrant skin & cells. It has a low glycemic load and negative inflammatory factor.